Finally a book on ferns! Gil Nelson has done it again with another wonderful native plant identification guide - The Ferns of Florida. 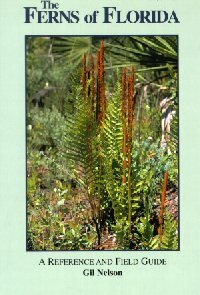 This book is a 'must have' for any Florida native plant or fern enthusiast, and if you are neither you may become one after reading just the introduction. Here Gil addresses the history of ferns, fern conservation, fern gardening, the classification of ferns, plant classification, the language of botany, fern morphology, the fern life cycle, and fern hybridization. Inspirational and informational to say the least! Gil has made this book inspirational yet scientific - a perfect addition to the library of both the novice or botanist. The narrative on the 2-3 acre site in Citrus County, discovered by A.H. Curtiss in 1902 and later described by Roland Harper, describes a hammock at the edge of a river swamp where "cliffs, chasms, and grottoes" were teaming with rare ferns, gave me the inspiration to go experience it for myself - only to learn that the previous owner of the property had destroyed the grottoes. Fortunately, the appendix covers parks, forests, and refuges in Florida with existing fern populations that can be visited. Keying out ferns is easy as pie with the included key and glossary. Let me warn you - if you're unfamiliar with fern terminology you should study before you attempt to key the ferns. As with any botanical key, the ease of use (mine at least) depends upon ones mastery of the glossary. One of my favorite parts of the book is the section of color plates. It is difficult to find a photographical reference of many of these species, therefore these are especially appreciated. I envy the trips into the field that Gil made to photograph the ferns that many of us otherwise may not get the chance to see. This is an invaluable addition to your field guide and identification manual library.